Seven HPD patrol units are seen outside a Food Mart where burglars smashed their way inside, causing significant damage to the building. 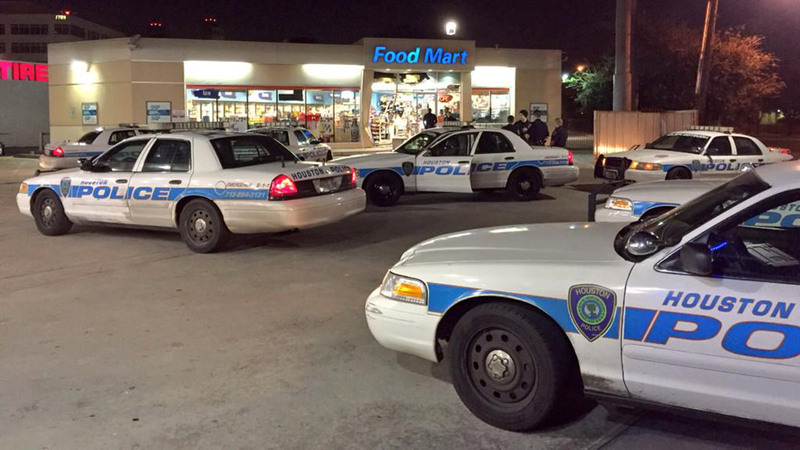 HOUSTON (KTRK) -- Burglars broke into a Chevron gas station overnight in Southwest Houston and stole an ATM. Police officers tell Eyewitness News four men used a brown Ford F-250 pickup truck to violently smash through the front of the store around 3:30am this morning. The gas station is located at the corner of the Southwest Freeway and Beechnut. Chevron employees said in a matter of 30 seconds, the crooks had loaded up the ATM and took off. Three workers were inside the store at the time. Fortunately, none of them were hurt. Investigators say three of the four men took off on foot behind the store. Officers quickly arrived and managed to arrest one of the suspects. The two others got away. Houston police say the fourth man drove off in the pickup truck. As of early Friday morning, the truck and ATM had not been located. Police say there is clear surveillance video of the crime. They are still investigating.